Maya Kramer is an artist an independent art writer and arts project coordinator. She was based in New York City for nine years during which time she worked in the curatorial department of the Guggenheim Museum and for private collectors. In 2010 she moved to Shanghai, and has since exhibited internationally in conjunction with institutions such the Hong Kong Arts Centre, Hong Kong, and the Van Abbe Museum, Eindhoven, Holland among others. She is the recipient of the Jacob Javits Fellowship, her works have been featured in media such as Fortune Art, Randian and Blouin Art Info, and she has written for The Shanghai Gallery of Art, Artlink, and Bank Gallery. She currently lives and works in Shanghai, China. A shift occurs when stepping into Prada Rong Zhai. The chaos of Shanghai gets absorbed by the nostalgia and lavish beauty (almost embarrassingly so) of this meticulously restored 1918 mansion. It is a common phenomenon in this city, where the architectural ghosts of its modern heyday stand in uncanny relation to the novelty of its glittering skyline, a skyline still undergoing rapid growth. This type of psychic disjuncture and the possibilities it creates, relates to Goshka Macuga’s project currently on view in the Prada Rong Zhai space, “What Was I”. Through a series of calculated constructions and juxtapositions, the artist conjures timely and poignant issues confronting humanity at this moment. Images: Courtesy of Prada and the artist. Goshka is known for her research-intensive projects that mine the works of others, examine the ways in which we construct knowledge and that employ curatorial strategies as a way to reflect on those frames of thinking. 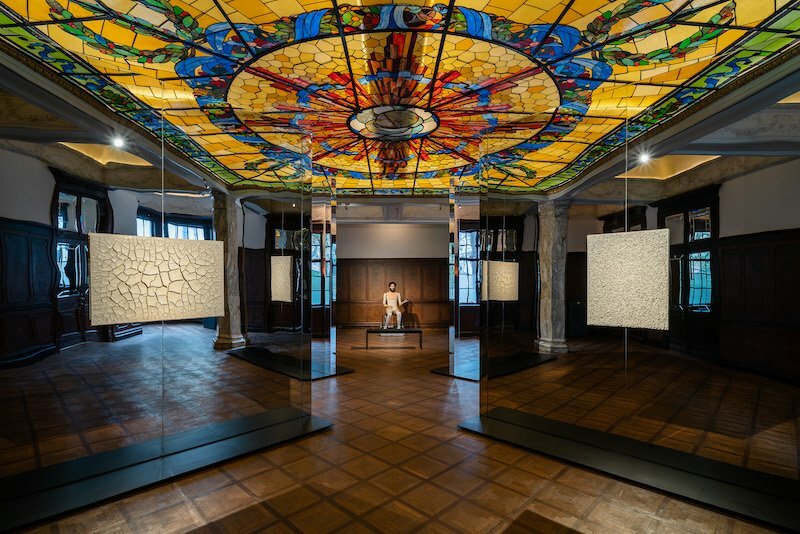 In ‘What was I” she creates a captivating AI robot whose intermittent speech, combined with the surrounding ornate space, hall of mirrors and a display of carefully selected works from Prada’s collection, open up an existential quandary. 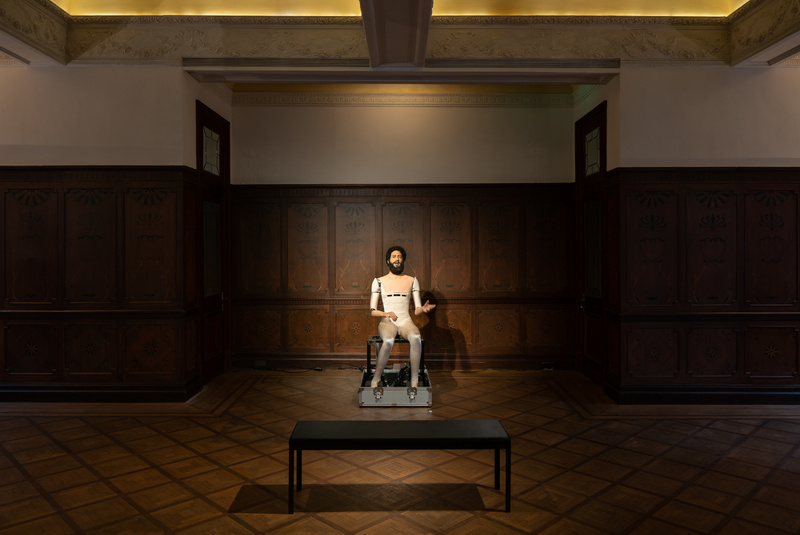 The locus of the exhibition centers around a male-faced AI robot, sitting at the head of the room, its visage and forearms are expertly simulated in silicone while the rest of its form is made from cloth and metal. That it is clearly connected to the programming equipment behind it makes it puppet-like. At timed intervals, the robot delivers a monologue, revealing it is from the future. The robot is essentially a fragment of human consciousness that has survived to the post Anthropocene era, “outliving” its makers who self-destructed. The AI’s sweeping speech is an elegantly constructed montage of western-centric history and quotes that meditate on memory, endings, genes, drives, behavior, god, rationality, progress, and the environment, among other themes. Even the long tradition of the end-of-the world scenarios, of which the robot itself is a part, is included in the litany. Within the speech there are a string of truisms, among them: “We are survival machines—robot vehicles blindly programmed to preserve the selfish molecules known as genes”, “Machinery that gives abundance has left us in want” and “Because what I have missed is what we need to grant our attention to”. That Goshka managed to craft this text in a way that feels resonant instead of cheesy, is in itself a feat. 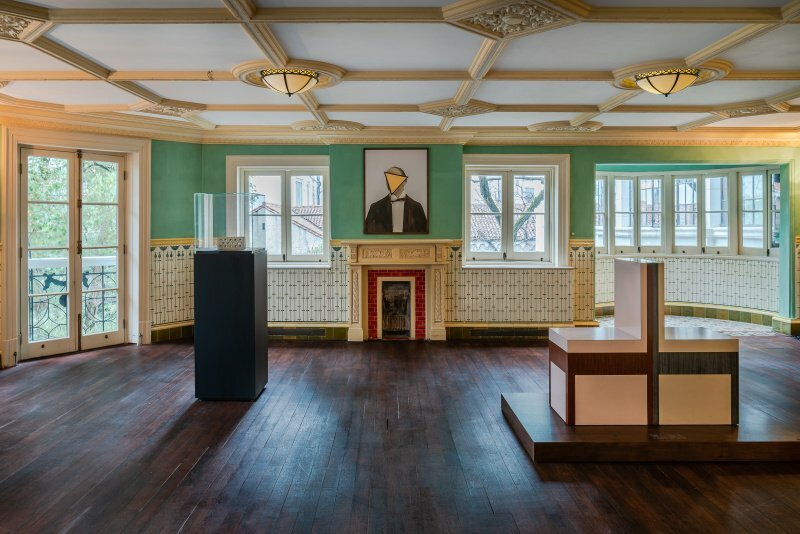 The rhetoric of the AI figure amplifies the sense of nostalgia and melancholy in the room and catalyzes new readings of the artworks Macuga selected from the Prada collection for display throughout the former mansion. Hung on mirrored panels facing the robot, works by such recognizable names as Alberto Burri, Salvatore Scarpitta, Enrico Castellani and Lucio Fontana, take on a simultaneously primal and futuristic qualities. Scarpitta’s bandages feel mummy-like, silent and buried yet acutely pained, the underlying trauma of their making in part stemming from the artist’s experiences in WWII—humanity’s last major collective reckoning with endings and mass destruction. Whereas Burri’s painting of a scorched and cracked surface, triggers that bi-polar urgent, helpless feeling characteristic of the Anthropocene era. That we get glimpses of ourselves in the mirrored surfaces onto which these paintings are hung, implicates us directly in this melancholy web. In other rooms, various works continue to inspire divergent reflections. Works by the artist Grazia Varisco, unknown to me before this show, shocked me with their simple brilliance. The contingency of the viewer’s visuality is made apparent through her use of pre-fab clear acrylic sheets that augment minimal patterns behind them in accordance with the audience’s movement. My initial euphoria at discovering her work, of course, soon gave way to exasperation and anger. Why do I have to be this old, and just now learn about such brilliant female artists when I have known of their compatriots for decades? Macuga also has this issue covered. She has considered the issue of gender in a nuanced way and built it into the show. In close proximity to the Varisco are three collages Macuga made, in which she was thinking of weaving. She in turn relates weaving to the genius Ada Lovelace, one of founders of computer programming, in part through Ada’s famous quote, “The Analytical Engine weaves algebraic patterns just as the Jacquard loom weaves flowers and leaves.” A kind of algorithm of the mind is subsequently engendered that connects the robot, to Macuga, to Lovelace to ‘the role of women’ to the domestic setting and beyond. On the second level of the mansion, the space becomes more intimate and Macuga calibrates her choice of artworks accordingly. 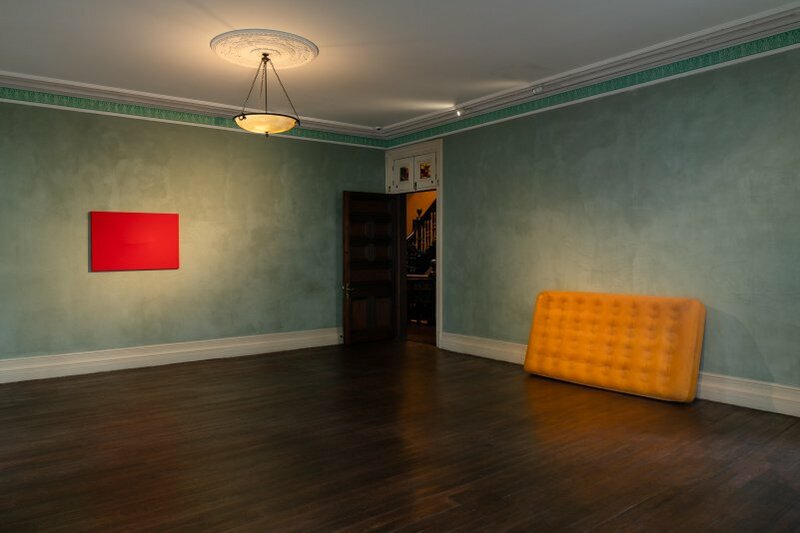 In the bedroom leaning against the wall is Rachel Whiteread’s beeswax mattress. Whiteread’s use of the language of minimalism– repurposed to accommodate a great deal of the content that was excluded from the minimalist movement, is exceptional in this setting. Near the Whiteread hangs a striking red, and slightly distended, painting by Turi Simetti that feels fiery and suggestive. Likewise, two small Fontana works, clay sculptures that carry his signature sexualized, violent, and mysterious slits within them, take on nearly pornographic associations in this context. Beyond the bedroom on the second floor, the effect of the other works on display do not possess the same magic, but by then it feels less consequential as the point has been expertly made. Goshka’s ghost/treasure/time hunt through this beautifully preserved ornate space reflects on humanity’s, daily, intimate, flawed, cruel, touching, heroic and sad existence. While elusive at best, there might be something there that is worthwhile. Maya Kramer is an artist, an independent art writer and arts project coordinator. She was based in New York City for nine years during which time she worked in the curatorial department of the Guggenheim Museum and for private collectors. In 2010 she moved to Shanghai, and has since exhibited internationally in conjunction with institutions such the Hong Kong Arts Centre (Hong Kong) and the Van Abbe Museum (Eindhoven, Holland) among others. She is the recipient of the Jacob Javits Fellowship, her works have been featured in media such as Fortune Art, Randian and Blouin Art Info, and she has written for The Shanghai Gallery of Art, Artlink, and Bank Gallery. She currently lives and works in Shanghai, China.